Blood clot. 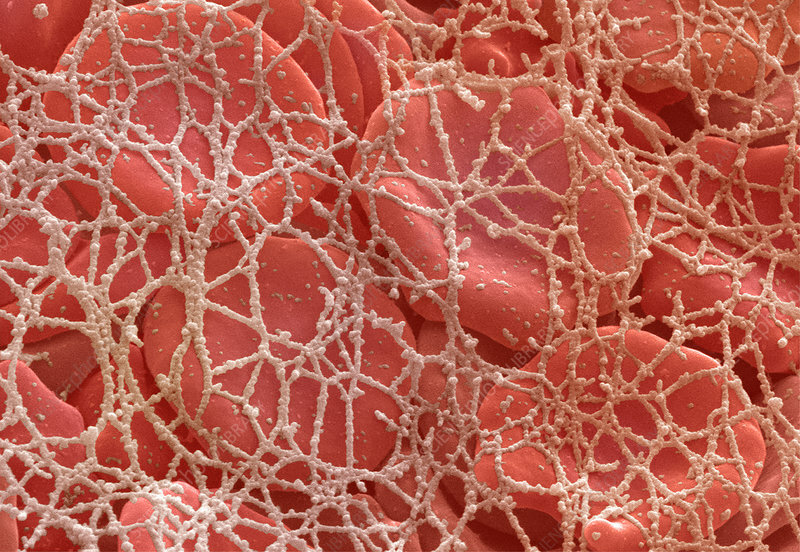 Coloured scanning electron micrograph (SEM) showing the formation of a blood clot. Red blood cells (erythrocytes) are seen trapped by a sheet of protein material made of hundreds of tiny fibrin threads (grey). As the blood cells become trapped they will begin to lose their normal rounded shape. Blood clots form to repair blood vessels damaged by injury or disease. Abnormal clotting in blood vessels, as occurs in a thrombus in intact arteries and veins, is the principal cause of heart attacks and strokes. Magnification: x4125 at 5x7cm size.